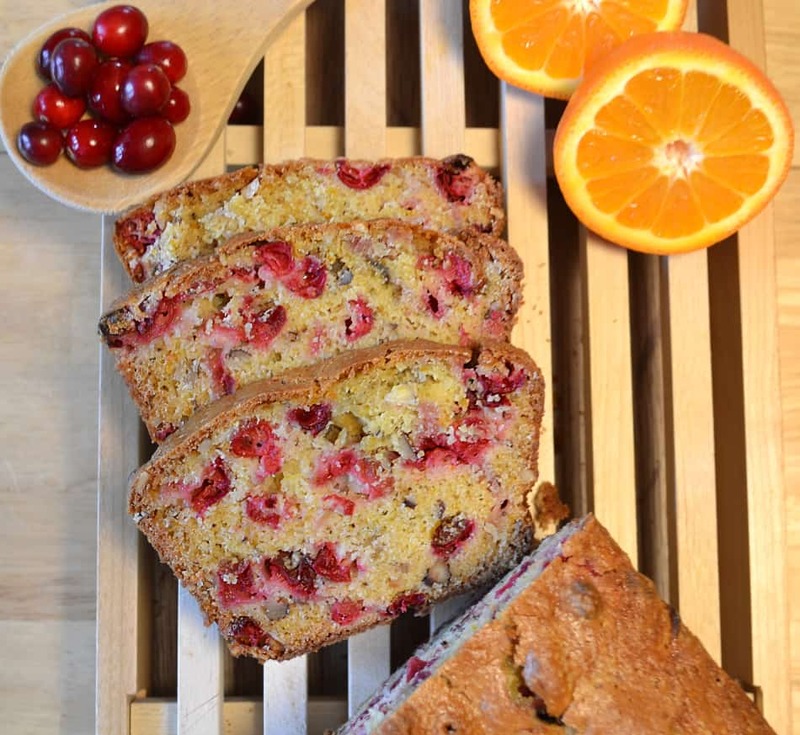 This Cranberry Nut Bread is perfectly moist & delicious! Cranberries and orange make this bread full of tangy tart sweetness. I’ve been craving cranberries this past week. After being sick and finally getting some taste back I needed something to shock my taste buds with some major flavor. Mmmm…cranberries with all their tart sweetness. 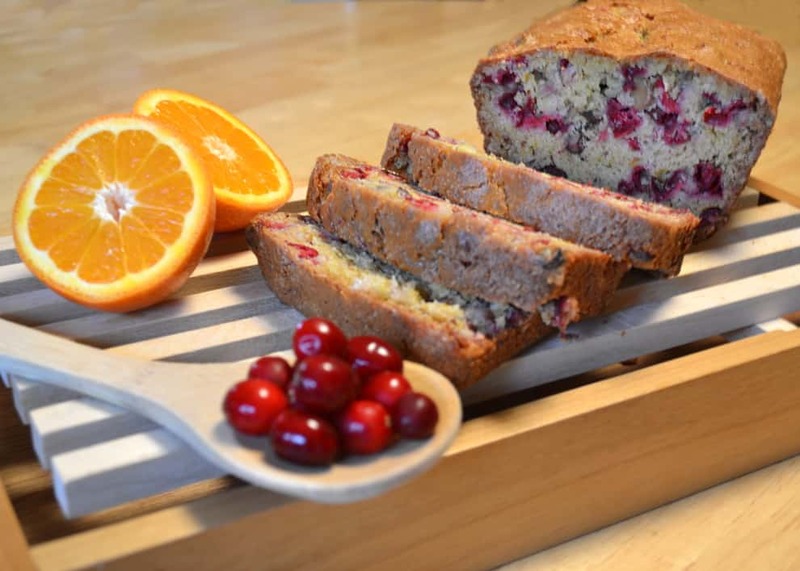 Even better – Cranberry Orange Nut Bread. Months ago, I stocked up on a few bags of cranberries. In case you didn’t know – cranberry prices drop like crazy after Thanksgiving and Christmas. They freeze perfectly, just throw the little baggies in the freezer as is. Added bonus – cranberries can be baked without being thawed. How’s that for simple!? While happily filling my cart up with bags of cranberries an older lady chatted me up for a bit. She was also a cranberry enthusiast and recommended I try the bread recipe on the back of the Oceanspray bag. Duly noted. This bread, like all quick breads, goes together very easily. They’re pretty much foolproof – just don’t over mix or over bake. Every good cranberry bread or muffin I’ve ever had the pleasure of eating always had big bites of berries in it. Hence why I prefer to cut most of the cranberries in half, just leaving the little ones whole. I know you’ll be tempted to pull out your food processor, really though, skip it this time. It’s not that bad of a job when the cranberries are frozen. As for nuts, I used what I had on hand – a mixture of walnuts and almonds. This bread is delicious – perfectly moist! 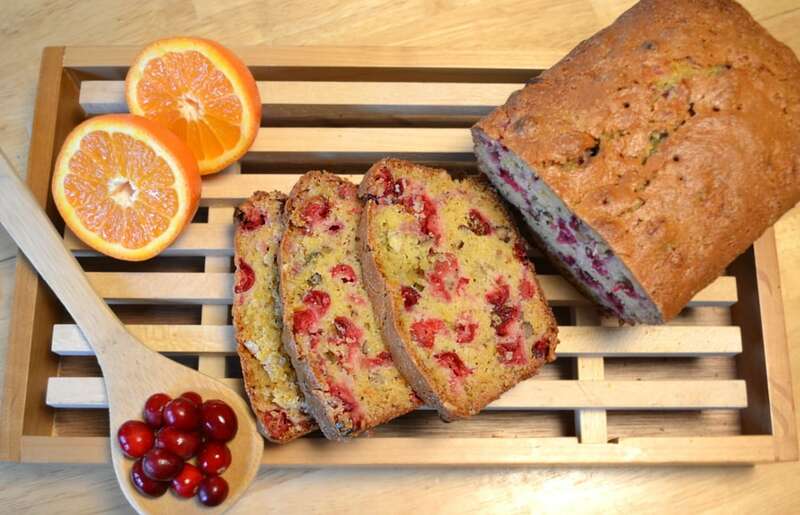 The orange and cranberries make this bread full of tangy tart sweetness. The nuts give it the perfect bit of crunchy texture. I love eating it as is, with a smear of butter or browned with a bit of butter in a frying pan. Yummers! This folks, is why I stock up on cranberries the way I do. I love cranberries and get to enjoy these otherwise “seasonal” treats year round. I hope you enjoy this recipe. Thanks for reading and Happy Baking! 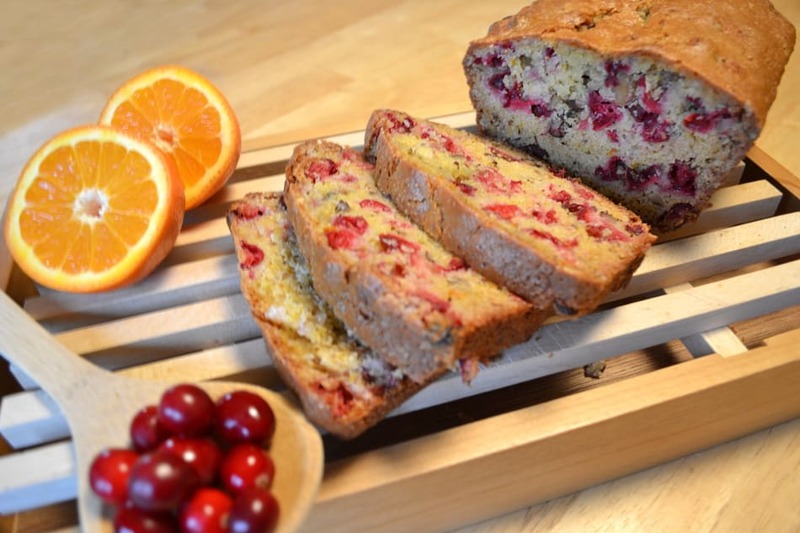 This Cranberry Bread is delicious - perfectly moist! Cranberries and orange make this bread full of tangy tart sweetness. Preheat oven to 350ºF. Grease/spray a 9x5" loaf pan. In a large mixing bowl, whisk together flour, sugar, baking powder, salt and baking soda. Add in orange juice, vegetable oil, orange peel and egg. Stir until just combined - DO NOT over mix. Stir in cranberries and nuts. Spread evenly in loaf pan. Bake for 50 - 60 minutes or until a toothpick inserted in the center comes out clean. Cool on a wire rack for 15 minutes. Remove from pan and cool completely. This looks lovely, perfect for spreading with butter and enjoying with a cup of tea. Cranberry and orange is such a great combo. We have recently started a food sharing website and would love you to submit this. I have never really tried cranberries before but your recipe looks so easy and delicious I am going to give it a go! 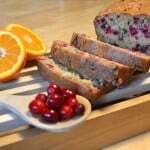 I have been making cranberry orange nut bread for several and handing them out for Christmas. Everyone loves this bread that I can barely get a loaf for myself. Ohhhhh….I love ending up with several bags of fresh cranberries! I actually buy bags upon bags during the season and freeze. So glad you all enjoy the bread – it’s one of my all-time favorites! I love this recipe–we make it many times each holiday season. My son has developed a gluten allergy. Can I make this recipe with gluten-free flour? I haven’t tried this one yet – but all the quick bread recipes I’ve made so far with Bob’s Gluten Free 1-1 Flour have turned out perfectly. I liked cooking this with your directions by my side. It felt like a friend in the kitchen. I am in Australia now but grew up in California and also lived in Connecticut for a time. I buy some cranberries every year, but sometimes they stick around in the freezer. I cut them in half as you suggested and then teased it out with some whole cranberry sauce…so I used less sugar. Also tried organic coconut oil 1/2 and 1/2 vegetable oil. Cooking now! Smells great. Amanda, I made your nut bread recipe, for this Thanksgiving. It’s the best I have ever had. Very easy to make. I would advise everyone to make it as well. Thank you.